HOUSTON (AP) – Major League Baseball (MLB) received an A rating in racial hiring practices in Richard Lapchick's Institute for Diversity and Ethics in Sports 2013 report at the University of Central Florida. But the number of black major leaguers remained low at just 8.3 percent. Commissioner Bud Selig touted the progress the league made in racial hiring practices while stressing his desire to increase the number of black players in the sport. 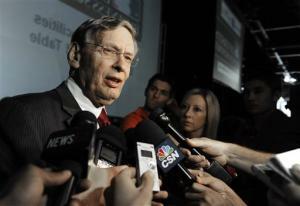 Selig spoke Wednesday at the MLB diversity news update business summit. "We constantly strive to find ways that would make Jackie Robinson proud of his chosen sport," Selig said. "We have seen (to it that) the work of our diversity committee ensures that qualified minorities are interviewed and considered for important managerial and executives roles. "We plan to supplement this progress with an on-field diversity task force. The task force will work to improve the talent pipeline to professional baseball, particularly for African-American players." The summit was the second of its kind after the league hosted it for the first time last year in Chicago. It is a chance for people to explore employment and business opportunities with all 30 major league teams at a trade fair. The Houston Astros co-hosted the event and owner Jim Crane is proud of the diversity in his organization. "The city of Houston is very diverse and baseball has gotten behind this diversity summit," Crane said. "It was in Chicago last year and we were the first one to volunteer to have it here this year. We think it's a great idea and gets people talking to each other and make some connections." Selig spoke of Robinson often during his address, and talked at length about baseball's efforts to increase the number of African-Americans in the sport. He noted that there are more than 210,000 participants in the league's Reviving Baseball in Inner Cities (RBI) program. Selig said it was important for MLB's Urban Youth Academies in Compton, Calif., Houston, and Philadelphia to help get more African-Americans involved in baseball. As well as encourage them to not get involved with activities that might create a lifetime of racial discrimination cases and prison, which many youth of color face throughout the country. "Though we have much work to do, there have been encouraging developments in recent drafts as 13 African-American players have been selected in the first rounds of the 2012 and 2013 draft," Selig said. "We have seen nearly 60 alumni of our RBI and Urban Youth Academies selected in these drafts." First-year Houston manager Bo Porter, one of three African-American managers in the majors, participated in the event. "Major League Baseball has gone to great lengths to have diversity be a part of our game," he said. "It's something that I personally appreciate. I think it's great for baseball and great for everyone." Selig said events like Wednesday's are one of the most enjoyable parts of his job, and he hopes it will help people understand the different ways they can be involved throughout the sport. "Baseball must continue to be more than just a game on the field," he said. "The game's remarkable ability to serve as a common bond should be used to create opportunities for all people regardless of race, religion and gender."